"Planetary operations" began 40 days before orbital insertion, a date chosen arbitrarily. As the first spacecraft approached Mars, the pace quickened on Earth. Much lay directly ahead-final instrument calibrations, optical navigation, course corrections, approach science observations, Mars orbit insertion, spacecraft navigation, landing site certification, entry, landing, and finally initiation of the landed science experiments. After that burn was executed, the leak continued, but a second engine burn on 15 June reduced the pressure in the tanks to an acceptable level. After orbital insertion, the line between the helium tank and the faulty regulator was closed and the remaining helium posed no further threat. These two maneuvers slowed the spacecraft down, delaying insertion by 6.2 hours. Additional maneuvers could have held the arrival time constant, but the men in Pasadena preferred not to waste the spacecraft's propellant. Orbital insertion of Viking 1 required a long engine burn-38 minutes of thrust, which consumed 1063 kilograms of propellant and was more than twice the time of the engine burn required by Mariner 9 to enter Mars orbit, Viking had to be slowed from its approach speed of 14400 kilometers per hour to 10400 kilometers per hour for insertion into orbit. To bring the spacecraft to the proper point at its first periapsis, the mission flight path analysts placed it in a long, looping 42.6-hour revolution of the planet, reaching first periapsis at the time originally scheduled for the second. Previously computed timelines could be maintained with only a minimum of modification. The Mars of Viking was strikingly different from the Mars of Mariner for two reasons. First, the Viking cameras permitted the imaging team to see far more detail. And second, they could discriminate ground features more readily because the Martian atmosphere was much clearer. Hal Masursky remarked that large lava flows in the Viking photographs were totally invisible on Mariner images. "There was enough fuzzy in the air so all that stuff just vanished into gently rolling topography. We can see the sharp edges of little tiny lobate lava flows standing on one another." From studying the Mariner findings, the photogeologists had come to believe there were very few small craters on Mars; now they found fields of them. Masursky recalled, "Jim Cutts wanted us to....count all these thousands of craters....That's interesting, but it wasn't necessary for site certification. You can take off your socks and count all the craters you need" to know that it was a dangerous place to land. 26 Masursky and his colleagues now understood that the dust had never really settled during the Mariner 9 mission. Instead of a blurred surface, they now saw a fantastic array of geological detail. Mars was at once an intriguing and forbidding planet. 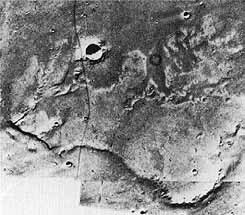 The first closeup of the Chryse region of Mars- the A-1 candidate landing site photographed 22 June 1975 from Viking I orbit- changed the Viking schedule. A channel floor with depressed areas and irregular edges, as well as the many craters, did not make an inviting area for the lander. The center of the photo is at about 18°N latitude, 34° longitude. Other photos (opposite) followed. At a 24 June Viking press briefing, Lee explained what was going on behind the scenes. Between 300 and 400 persons participated in the site certification process. When the pictures came down from Mars, JPL, the Astrogeology Center at Flagstaff, and several other organizations went to work. Every night, a Landing Site Staff meeting was held, divided into two portions-operational and analytical. Were the photos, mosaics, maps, and the like acceptable and on time? What did it all mean? To find a safe place large enough for a landing ellipse, the team would need more photo coverage, possibly to the northeast or northwest of the prime A-I site. 28 Apparently the spacecraft could go either direction without upsetting the timetable for a Fourth of July landing. 29 The next 28 hours were just the beginning of a very busy, tension-filled period. At noon on 25 June, the press heard from Lee and Care. The Viking Project Office had decided to move the P6 photo coverage 60 kilometers farther to the northeast than previously planned, to avoid the southwestern part of the original landing ellipse where the so-called etched terrain, or scablands, were. Just before midnight on the 24th, the latest P4 photos had come in to fill the gaps in their mosaic. Lee, Carr, Masursky, and nine other members of the imaging team had sat there for more than 30 minutes sliding ellipses around on the mosaic in an effort to find an area where it might be safe to land. So far, there was no safe haven. 30 To study these images, Mike Carr had three groups working for him. Bill Baum led the analysis of atmospheric phenomena. Ronald Greeley was in charge of geological mapping. 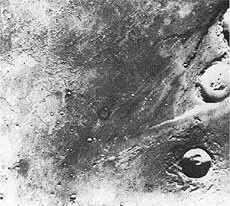 Jim Cutts and Win Farrell were making quantitative analyses of landing site hazards, and Henry Moore oversaw the mapping of these craters, knobs, and hummocks. [whole page 333] More photos of the Chryse region on 22-23 June 1976 told the unhappy story. The A-1 landing site was not safe. Above left, a camera on orbiting Viking I photographed an "island" in a rough channel complex with eroded rims. A closer view above right shows a channel and craters. At right, "islands" with etched layers of rock are in the channel of Ares, largest channel in Chryse, in a pair of high-resolution photos. Meteorite-impact craters pepper the surface. Below, a mosaic of 12 photos is the center third of a strip taken by Viking I on its second low pass over Mars on 23 June. A-1 lies toward its center. The P3 reconnaissance coverage was successful in that it provided some room to maneuver the ellipse when the original location turned out to be unacceptable, and we have some overlap on the last Arecibo radar coverage at 17-18°N. At the end of the staff meeting, a straw vote indicated that 20 members of the group favored staying with A-1, while 24 wanted to move on to A-2. Jim Martin did not vote, but he indicated that he would take all the views into account before the decided which course to follow. Martin was not long in making his decision known. A landing site meeting that lasted most of the day on 26 June suspended the regular order of business to let the group concentrate on two options outlined by Gentry Lee. The spacecraft could be moved immediately to the northwest for a possible landing in the region called Chryse Planitia. Photographs of that area would be compared later with Arecibo radar Coverage scheduled for 4 and 5 July. Or they could reject Chryse altogether and go directly to A-2. Martin explained that he had decided not to land at A-1 (19.5°N, 34°) or the alternate A-1 (19.35°N, 32.5°) on 4 July because project specialists did not understand the processes that had formed some of the visible topographical features. Without a clear understanding of the geology at the 100-meter scale, predicting what the surface would he like at the scale of the lander would have been nearly impossible. Now that the decision had been made to give up the attempt to land on the Fourth of July, a new strategy could be established. The team's major concern was that so little time was left for determining a course of action for Viking 1 because of communications complications that would be posed by the arrival of Viking 2 . Once the second craft came close to the planet, Earth-based controllers would have to ignore Viking 1 temporarily. According to Martin, the first new milestone would come on 29 June. By that time, they would have the P8 and P10 photos from the northwestern portion of Chryse. If those images indicated an impossible  terrain, the orbiting Viking 1 would be commanded to move over the A-2 region for landing release on 20 or 22 July. Martin pointed out that it was now essential to get more coverage at the B-l and C-l sites. The delay in landing meant they would know less about the surface than they had planned when it came time to find a landing site for Viking 2 . The Landing Site Staff had hoped to have orbital and surface photography that would establish "ground truth'" for the orbital images. According to Masursky, "ground truth" simply meant that you could trust the 100-meter photographs to tell you there was nothing at a smaller scale that would hurt the lander. There was no time for determining such truth now. The risk we are running in this change in plans is that we may have 2 landers in orbit at the same time. The last date in July we can land VL-l is 24 or 25 July. From July 26 through August 8, we can't land VL-1 due to Mission 2 work. If we have any problems in any of this new plan, we will have 2 landers in orbit and we may have to land one after conjunction. a. Do you want to land at A-IS (19.35°N and 32.5°W) on July 4, 1976? b. Do you want to observe NW of Chryse and plan to land there July 21 with the contingency to go to A-2 and land after August 8 if anything goes wrong? c. Do you want to go to A-2 as soon as possible, keeping B l and C l observations and landing about July 22? The votes were 24 for option a, l7 for b, 2 for c.
NASA has decided to delay the Mars landing date beyond July 4, pending a further investigation of likely sites on the Red Planet. Project officials feel that the terrain in the pre-selected landing area, called Chryse, may be too hazardous. Orbiter photographs taken during the past few days reveal a much more cratered and rougher area than previously shown. Officials want to study an area to the northwest of the primary landing site, called Chryse Phoenicia, which may be more suitable than the previously selected site. A new landing date will be selected in the next several days, depending on what new information is revealed by further site investigation, officials said. Additional details concerning the rescheduled landing of Viking-I will be discussed at a news briefing at the Viking News Center at 9:00 a.m., POT, Sunday. Viking-1 has been orbiting the planet since June 19, faking photographs of potential landing sites. Jim Martin met with the press Sunday morning, 27 June. "After careful examination of the landing site pictures that we have been taking for the last several days, we have decided that the A-1 area....appears to have too many unknowns and could appear hazardous." He had decided, and the NASA leadership had agreed, to postpone the touchdown while other areas were examined. He explained the A-1 northwest strategy, which if unsuccessful would be followed by a look at A-2. By going northwest, they hoped to get out of the channel, or "river bed," and into a basin, or "river delta," region. "It has been suggested that the fine material that has been washed out of the river bed....has been swept downstream and maybe has collected in this basin. If so we might expect to see sand dune fields, we might expect to see craters filled with sand or dirt.'' He hoped this could be a  better landing site. Noting they had always planned for such a contingency, he outlined the steps they would take during the next week. After the C-1 photos became available, Martin thought the project team could draw some more decisive conclusions, but he warned the Viking specialists that even after their examinations they still might not come to understand Mars. "Things completely unknown to us" might be going on there, Martin said at the press conference. 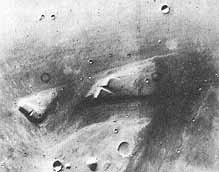 Available Mariner 9 photography indicated that A-2 was likely to be rougher than the parts of Chryse seen thus far. Unhappy as they might be, they might have to land at a point in A-1 that they did not like. "If that were to happen, we would land some time between the 8th and 12th of July." A landing at A-2 would take place on the 22d or 23d. At this time, Martin could not be more specific: he and his advisers needed more data. During the question and answer session that followed the press briefing on the 27th, Martin was asked if any single factor had caused him to decide against A-1. He replied that he had been concerned since he saw the first pictures and a great deal of analysis had been done since then. Hal Masursky had been working 20 hours a day; others on the team had been putting in 16 to 18 hours daily. The telling points came at the meeting on Friday evening and the long session held that day. "I came to the conclusion last night that I had enough concerns about the safety of the landing site that I thought we must go examine additional sites." As things worked out, the hard work had just begun. Landing Site Staff members had to schedule their duties around noon status briefings for the press and their evening staff meetings. Sometimes working copies of mosaics were spirited off to the photo lab so that composite pictures could be released to the media. Given the strong interest and positive attitude of the news people, the photogeologists could not really complain, but such incidents were trying. It was not uncommon for new data to be delivered during staff meetings, and Masursky and his colleagues would be called on to make instant analyses before a group of several dozen specialists. Instant science became a way of life during the last days of June and early July. There was no time for idle speculation, no respite for reflection. Decisions had to be made against the clock and the mission schedules. And only human beings could make these decisions. Meeting for the 13th time, for four and a half hours on 30 June, the Landing Site Staff wrestled with the three potential landing targets. During the facilities report, the men in charge noted that fatigue was beginning to catch up with some of their people. In turn, 10 specialists reported their latest information and opinions. Masursky synthesized the A-1 site selection and certification process: Two and a half years earlier they had put the ellipse at the channel fronts "in the hope of getting wet sediments." This spring they had added one further northwest site, to avoid channel-borne boulders. and one northeast site, to include the best radar location. "In all of this, we did not anticipate that the channels would be incised deeply in the A-1 site region." 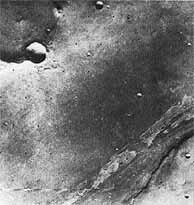 Mariner 9 had shown gentle workings in the areas where they could now see stream cratering. Comparative crater counts showed that if they had gone to "A-1 biased" (A-1 revised. formerly called A-1S, l9.35°N, 32.5°), "we would have been in reasonable shape. There is not a significant difference between A-1 and A- 1NW. We did have to go further NW to avoid incised channels, but this is not a marked change. Our course is not dramatically different from what we set out on" two and a half years earlier. 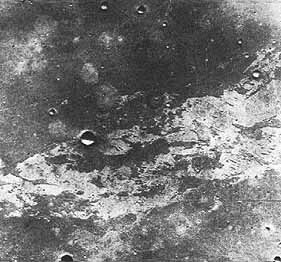 A-2 seemed less safe at the moment; knobs and craters were more predominant, according to Mariner 9 findings. In the A-1 region, Masursky said, "the ranking is straightforward. Jim Cutts' crater counts clearly show that we are moving in the right direction. The choice is heavily weighted to the NW." The sun elevation, however, was somewhat higher in the P8 and P10 pictures than in P1 and P6, and lunar experience indicated that as the sun went up craters disappeared from photos. Overall, Masursky rated the sites: A-2, worst. A-1 revised, next. A-1 NW, best from available data, the most favorable site at the moment. Views on 27 June 1976 of the A-1 NW Chryse Planitia site, an alternative to the A-1 landing site on Mars, did little to relieve Viking team worries. 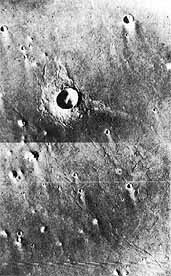 Viking I's close look, in the two orbiter frames at left, reveals an impact crater, ejecta blanket, many small craters with wind tails (probably dunes), fractures, and knobs of rock. Above, the irregular south edge of a plateau appears to have been shaped by the flow of water. 1) Good data obtained from Chryse Planitia July 3,4. Data to West and to the East obtained July 2 and 5 respectively. 2) July 3 and 4 provide detailed repeatable results from 41° to 46°W with integrations as short at 0.7° in longitude. 3) One-half power widths generally corroborate Carpenter['s 1967 observations]. Generally rough between 35° and 50°W, smoother to the East and to the West; with general quantitative agreement. 4) Chryse Planitia is a complex radar area, generally of roughness comparable to area observed by Arecibo SW of A-1 (33°37°W. 17.5°N). On the average. Chryse Planitia and SW A-I are not distinguishable by the current observations. 6) Spectra from Chryse Planitia on both July 3 and 4 show a "spike" corresponding to approximately 42°W, suggestive of a smoother area near that longitude. 7) There is no area within the regions probed in Chryse Planitia, of size greater than about 3° in diameter, as smooth as the Martian average (assuming that the reflectivity is not also anomalously low). Martin, presiding at the 18th Landing Site Staff meeting the night of 7 July, opened by saying: "We must move forward, if not to land, to do other things. We must today tell" the Spacecraft Performance and Flight Path Analysis Directorate what direction (east or west) to go tomorrow. "The outcome of these discussions will be to continue to 23 1/2°N and 43 1/2°W (the A-1NW site), or go over and observe farther west....We must be prepared to continue beyond 6 p.m. tonight to air all viewpoints." P-19, Mars orbit trim 5. P-20, take 80 frames of monoscopic reconnaissance coverage of WA-1NW to 55°, contiguous to the P-10 coverage. P-22, 80 frames contiguous to P-20 coverage. P-24, accept or reject area covered in P-20 and P-22. P-25, Mars orbit trim 6. P-33, Return to A-1NW and land there. And photography versus radar continued to be a dilemma. Site A-1NW assessment by radar was that it was "bad"; by photos, "good." Site WA-1NW radar assessment was "good," but no photos would be available until P-20 and P-22. Good photos to accompany the good radar of the "far west" would mean a landing there. Bad photos and good radar would mean going back to A-1 northwest. It was obvious that it was difficult to say exactly what the various radar signal returns meant. Sometimes the Landing Site Staff could say with assurance that a particular signal reduced to spectral lines on a graph equaled a specific terrain. Other spectra were just not fully understood. Tyler was the first to say that he did not "want to land without images" of the landing site. Young gave the group two choices-A-1 northwest on 17 July, or go west to west A-1 northwest and try for a landing on the 20th. If the pictures there were bad, return to A-1 northwest and land on the 23d. NASA officials have decided to study a possible new landing area on Mars, some 575 kilometers (365 miles) further west than the previously planned site. This will delay the landing of Viking l at least until July 20. New radar results obtained July 3 and 4 at Arecibo Observatory indicate that a more westerly area of Chryse Planitia may be smoother than the previously selected northwest site. This area....has not yet been photographed by Viking. Viking l will perform an orbital trim maneuver at approximately 5 p.m. PDT, Thursday, July 8. to begin moving the spacecraft over to the western region, where high resolution photographs will be taken Friday, July 9, and Sunday. July 1l. If Mars were perfectly smooth, one would see a single spot....that's about one kilometer in size. That spot would be bright; otherwise Mars would be dark. As you roughen the surface of the planet this single spot breaks up into a multitude of smaller spots so that one sees a speckle pattern around the....radar point....This pattern would be bright and otherwise the planet would be quite dim.....As you increase the roughness....the size of the speckle pattern increases. So a very smooth location on Mars will produce a very tight pattern, and a very rough location produces a broader pattern. The fifth-orbit trim maneuver was executed just before 6 pm PDT on 8 July. After loading the spacecraft's computer memory with the maneuver command, ground controllers had temporarily lost contact with Viking for an expected blackout period, from 4:40 to 6:13 p.m. Viking 1 performed the 40.77-second engine burn flawlessly and was on its way to look at the "far west." The next day for important decisions would be 14 July, by which time the P20 and P22 photos would be fully evaluated. Then the project team could choose between west A-1 northwest and A-1 northwest. On the 12th, the site staff met to consider the insights for the Viking 1 site gained up to that point from the P10, P20, and P22 photographs. John Guest of the University of London had reviewed the revised and updated geology hazard map and found that neither textured surface nor grooved plains existed in the landing ellipse, except possibly some fine grooving below the resolution limit of the cameras. Additionally, channels disappeared or stopped rather suddenly, and Guest thought this indicative of their being covered over by wind- or water-borne dust or larger particles (a process called mantling) rather than their being below the resolution limit. Hal Masursky believed that existence of this younger, thicker mantling was consistent with the drop in radar reflectivity in that direction. Norm Crabill noted in the meeting minutes, "As we go west, we get into older geologic units and sharper reflectivity, with sharper features appearing further west." Masursky believed that they had reached the best location for a landing. He reported that although the slopes in the new ellipse (47.5° longitude) were as bad as those in A-1 the radar reflectivity was better. Significantly, this region seemed to have relatively few young impact craters, which meant that the area was probably covered with weathered materials that would pose less of a hazard to the lander. Len Tyler presented findings from the continued radar analysis. Tongue in cheek, he suggested that the reflected signals dropped off significantly  either because of scattering caused by the surface or because of a hole through the planet. But, despite the "Chryse Anomaly," he noted that the surface looked better at 47¡ to 48¡. Radar data were once again the subject of considerable discussion among the specialists, hot after a couple of hours Martin closed the session. They would reconvene that night to consider the additional P22 pictures processed by then and reach a decision. If they could not do so quickly, they would meet at 3:00 the next morning and continue to meet until they selected a landing site. Some tempers and senses of humor were wearing thin, but Martin continued to display his steady, firm, authoritative manner. A decision needed to made, and he intended to see it through. Hal Masursky opened that night's session. He saw three possible landing areas: alpha, at 22.4°N, 47.5°; beta, at 22.5°N, 49.0°; or gamma, at 22.0°N, 51.0°. After the staff had moved ellipses around the photomosaics (playing what Masursky called "cosmic ice hockey"), counted hazards, and evaluated radar, alpha looked best. Mike Carr expressed an opinion held by several attendees at that late meeting on 12 July, "Don't prolong the debate, the choice is clear." Too often, he thought, meetings had lasted a specific number of hours simply because it was traditional for them to last that long. He was ready to force the vote. With site certification completed on the 12th and the spacecraft's orbit adjusted on the 16th, the project focused its attention on preparing for a 20 July landing. Final descent trajectory information and minor sequence changes were sent to the orbiter, and a set of commands for entry, landing, and the preprogrammed mission was transmitted to the lander. The same set of commands was transmitted to the Lander Support Office at Martin Marietta, where a computer-simulated mission was being flown. At 5:12 a.m. PDT on 20 July 1976, the seventh anniversary of man's first stepson the moon, the Landing Site Staff learned that the Viking 1 lander had touched down safely on Mars 19 minutes earlier. The job half done, the staff continued to evaluate sites for the second spacecraft.